We’re Engaged! – Photo Contest. Upload your photo for a chance to win! 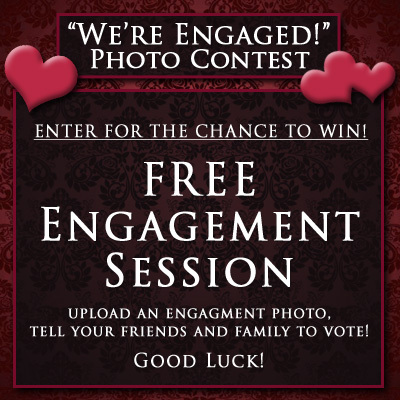 Free Engagement Photo Session – Enter to Win! To celebrate all the newly engaged couples, we are holding a “We’re Engaged” – Photo Contest. This one’s gonna be easy to enter folks! If you are an engaged couple, upload a photo to us on our Facebook fan page, then tell all your friends and family about it and have them vote for your photo. There’s no obligation and it doesn’t cost anything to enter. All you have to do is visit our Facebook page, LIKE our page if you haven’t already and follow the instructions to submit a photo of you and your sweetheart to be eligible to win. You can use any camera, phone, tablet or other device to capture the photo. At the end of the contest, the photo with the most votes wins a FREE Engagement Session with us!